Suzie, born between mid '96 and mid '97 (maybe...) is a dark tortie. She lives with us since September 2001. 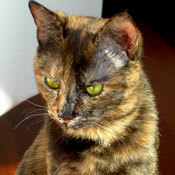 Lola, probably born in January 2003 is a "cinnamon" tortie, which means that red is dominant in her fur. She lives with us since February 2004. Lou, born in march 2004, looks very much like Suzie but bears an almost white patch on her face. She was very wild when we captured her in May 2004 on the Champs-Elysées (in the gardens of the Theater), we kept her with us ever since. 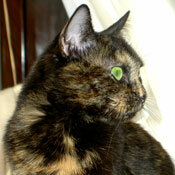 Mado, born in September 2005, a very small kitty with a gingerbread coat, very warm, closer to Lola's. Very shy when she arrived, she is now opening out with her "sisters". Sadly, after 2 and a half years at home, she disappeared in the Provence countryside and never came back. 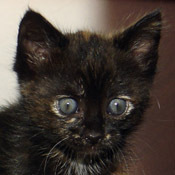 Simone, born June 2008, found in a trash bin on the roadside aged 1 month. Immediately very social she is a cute cat who found her place among her "sisters" and even more with her "elder brother", the handsome Mr. Fernand. 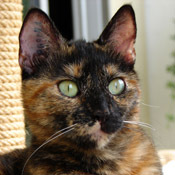 Gaby, born in April 2011, found when she was one month of age alongside a road in Perche (Southern Normandy). 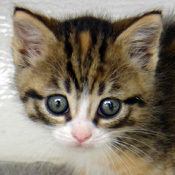 A caliby (tricolor with tabby pattern). Extremely social and cuddling, she instantly got friend with her "brother and sisters"
They get along very well together and play a lot. We took them with us on our summer vacations in Provence. It was a pleasure to see them play, chase each other around, climb in the olive trees and hunt till nightfall or even later! The plunder they offered us on our bed was made of lizards, mice, grasshoppers and even small scorpions! Sometimes we managed to free the preys to the great despair of the hunters!